Mamas, this is going to be a great night for a date night — or a girls’ night out! Pippin is such a fun show that’s just for the grown-ups. And we’re pairing these two show tickets for the opening night performance on November 10th (7 p.m.) with dinner at Bordinos. Now THAT’S a date night. 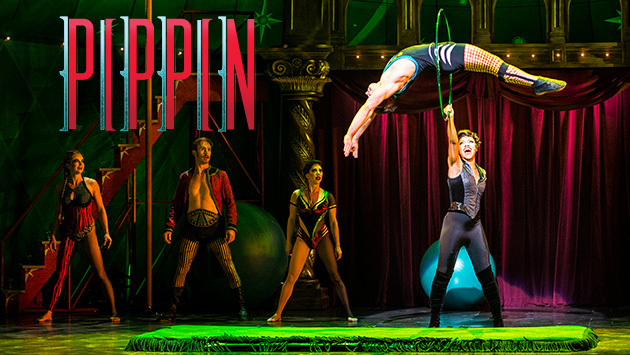 ABOUT THE SHOW: PIPPIN is Broadway’s high-flying, death-defying hit musical! Full of extraordinary acrobatics, wondrous magical feats and soaring songs from the composer of Wicked, PIPPIN will lift you up and leave you smiling. 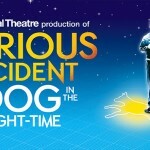 This unforgettable new production is the winner of four 2013 Tony Awards® including Best Musical Revival. 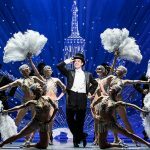 Hailed as “an eyepopping, jaw-dropping extravaganza” (NY1), it’s unlike anything Broadway has ever seen. Come experience PIPPIN, one young man’s journey to be extraordinary. The ensemble cast tells the story of Pippin, a young prince who longs to find passion and adventure in his life. To prove his loyalty to his distracted father, King Charles, Pippin goes to war. But when the Leading Player convinces the prince to fight tyranny, Pippin kills Charles and takes over the throne. Realizing his mistake, Pippin begs the Leading Player to bring his father back to life, and she obliges. The prince falls in love with Catherine, a widow with a young son, and (much to the Leading Player’s chagrin), Pippin struggles to decide whether he should settle down and pursue a peaceful life or continue to make magic with the dazzling troupe of performers. 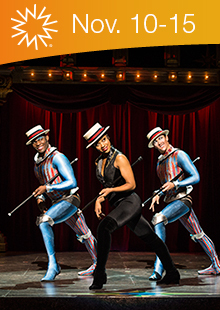 Click here to read more about Pippin or to get Walton Arts Center tickets. 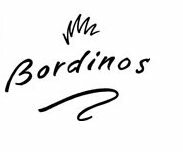 ABOUT THE FOOD: We ♥ Bordinos! The food and atmosphere is fantastic at this beautiful restaurant on Dickson Street. It’s consistently voted “best date night” in our nwaMotherlode local awards and one visit will show you why. Bordinos is just steps from Walton Arts Center, so you can make a night of it! You can also earn an extra chance to win by signing up to receive the free email newsletter we send once a week. Our newsletter subscribers get access to the good stuff, including exclusive giveaways (like this one), information about local events, local mom interviews, recipes and more. It’s delivered straight to your inbox so you don’t miss anything awesome. CLICK HERE to sign up. We won’t fill your inbox with info, no worries. We only send out newsletters when there’s something in it for you — and we know you’ll be interested in hearing about it. We’ll choose a winner on Friday afternoon, mamas! Good luck! Beauty Buzz: What’s it like to get a microdermabrasion treatment? 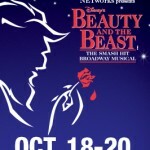 One thing I love about my husband, who will be my date, is that he loves musical theater. He had never been to a Broadway musical until we married and he is now a huge fan like me! I get the newsletter, follow on Pinterest and Twitter and commented on FB. We didn’t buy tickets this season and would LOVE to win!! My date would be my good friend Melissa who shares my love of WAC shows and has a husband like mine who isn’t all too interested in joining us for Broadway shows! My best friend went back to work last year so it’s definitely made girlfriend time a little tougher to find time for — so a super fun girls night out is just what we need!! If I win I will take my hubby with me. The best thing about being on a date with him is that he is always laid-back and has a good time no matter if things don’t go as planned. He always seems to have a good time and to enjoy being with me!! The favorite thing about my date is that he’s not only my husband, he is my best friend! Sounds like a great night out with my sister! No doubt it would be my husband. While he might not be overly excited about the show, we sooooooooooooooooooooooo need a date night. He works overnight so we hardly see each other and when we do we of course want to include our 2 boys, so that doesn’t leave much time for him and I. My favorite thing about the date I would take is that she’s my favorite girl in the whole world; she makes me laugh and shows me that having a daughter is a beautiful thing! I would take my husband as my date! He’s always on the road and only comes home every 8 weeks for two days or so. We would love a night out and to see Pippin with him would be even better! I love musical theater and he’s never experienced it and I would love for him to get a chance to experience it with me. Too many “favorite” things to list about my *date* of nearly 25 years… but among that list of favorites is his incredible work ethic. I’d love to have him slow down and just enjoy dinner and a show. My date would be my sweet husband who would do anything for me! He does things for me all the time that are so sweet from sending flowers to cooking dinner or doing chores. He works in construction but certainly enjoys doing that I enjoy, but secretly I think he loves them just as much!! I would take my husband! We could really use a fun night out together! I would love a night out! My husband would be my date for this. The only time we go to dinner/show is when we are in Vegas celebrating our anniversary. It would be great to relive that locally. I would take my hubby as a date! We haven’t been out on a date since before our 4 month old was born! It is much needed! My date would be my amazing husband. He treats me like a queen and does what he can for everyone. These would be for him. He loves the theater. The thing I used to love most about my husband is that we always had fun. We haven’t had fun–just the two of us–in so long. Having a toddler usually means we don’t have the cash for a night out–and we don’t make time for each other like we should. This might be just what we need! This sounds like a mother/daughter outing. A date night much needed with my husband!!! 3 kids with non stop activities. It’s hard to find time for just us, but I love spending time with him. Bordinos is one of our favorites! I would take my hard working, dependable, most amazing father and husband ever on this date. My husband and I have been together for 17 years, two kids, work troubles, and a serious illness, and we are still standing because of his integrity, dedication and heart. My date would be one of my girlfriends. I love them because they are always there for me and can always make me laugh! I am a single mom so that is much needed on a daily basis! My husband, who works so hard and deserves a night off. Need a night out with my hubby SO much! Would love this! I would take a sweet friend that is always a great listener and always willing to serve others. I would love to treat her to a GNO!! Get date nights as he is in grad school and has limited free time. A date night with my husband would be lovely! As all of you know, having small children = not much time for your spouse. This would be such a treat! My date would be my best friend Andi! She has held my hand through my divorce and all the mess that followed. She is my sister in heart and a hard working mom of two herself. This would be a great time for us both! I would take daughter who shares the love of theatre as much as I do. This would be such a wonderful daughter mommy date night! My favorite thing about my husband, who would be my date to this great event, is that he gives every ounce of his energy to taking care of our children and helping make sure our home runs smoothly. When he’s not teaching during the day he can be found doing laundry, washing dishes, or taking care of our four kids. He’s pretty special, loves musical theatre, and deserves a long overdue date night with me! This December, I will be with my date mate for 10years! We usually stick to dinner and a movie (theater, Redbox or Netflix), so going to a musical would open our horizon. I hope to enjoy more new things in our new season of marriage! I’m in desperate need of a fun night out! My date and I have been working crazy schedules. I love how he takes care of our family. I would love to have a fun date night like this. My hubby is an amazing father, husband, son, and brother. He has been my rock through many tough times-medical issues, surgeries, babies in the NICU, and one sweet baby going to heaven. He’s the type of guy who can just sit and listen to a friend in need for hours! Such a self-less person. So grateful to be married to him! My date, my husband, loves to go to the theatre for a date night! Would make a awesome date night! I would take my hubby. He is a hard working, loving, giving almost perfect hubby and i have been with him over 32 years now so i know what i am talking about. Yes he can be a pain but so can i. Love him and would love to go on a great date with him. I would love to win this and take my best friend Brandy!! She shares my love of the theatre. Plus anytime I can get extra time with my BFF, I’m all about it!! I would take my husband! He is always doing everything he can to put me and our kiddos first and to make sure we have everything we need! We very rarely get to have date nights so this would be a wonderful treat!! My favorite thing about my husband is his dedication to his family, job, and church. He is a firefighter who loves the brotherhood, and tradition of his job. When he’s not at work, he’s working hard at home taking care of our children. Our youngest is 13 weeks old, so we both need a night out! I’d take my best friend for a GNO. The best thing about her is that she understood and cared about my son (who has autism) at a time when we felt so isolated. She read the books I read just so she could learn more and understand him better. It meant the,world to me! My date (my husband) is handsome, funny, patient, and hard-working. My favorite thing about him? His faith in God which carries over to the rest of our family (including me). I would take my best friend as date/gno. We haven’t had a proper girls night in years. Plus it is wonderful to watch a show with someone that truly appreciate it and doesn’t need to take potty breaks during the best parts! MY FAVORITE THING ABOUT MY BEST FRIEND IS HOW GROUNDED AND DOWN TO EARTH SHE IS. I AM A DREAMER AND OFTEN HAVE MY HEAD IN THE CLOUDS. SHE BRINGS ME BACK DOWN TO EARTH WHEN I NEED IT. WE ARE BOTH MOMMAS OF LITTLE ONES, SO THIS WOULD BE A WONDERFUL OPPORTUNITY FOR A GIRLS NIGHT OUT! My husband Kolin would be my date! He always makes me laugh- one of my favorite things about him. We have only been to WAC for field trips so date night with hubby to make it about us would be awesome! My favorite thing would be spending the night with my husband and my best friend at the same time. I wouldn’t be the woman I am without his support (and enabling, hee hee). I want to take my mama on this date night, because she is so fun to hang out with and it would be a perfect way to celebrate my birthday!! I would take my husband. 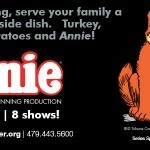 One of your favorite things is going to a Walton Arts Center Show. I would I’ve to have a date night out with my hard working husband, or a fun GNO with my sister! My sister will be here from California and I would LOVE to treat her to this!! Would be so nice and we would have so much fun together! I’d take my sweet daughter who is about to be a teenager. She would love a fancy dinner and show with momma. Best thing about my hubby is his heart. He gets it from his momma! But for such a strong and secure man, I’m always touched by how much he cares for others. This man will be brought to tears just hearing about someone’s struggle on a TV show. It cracks me up! Just a big soft hearted guy. Love him more than anything! I would love to take my best friend on a girls night out. She is so kind and giving and always there when I need her. I would take my husband with me. My favorite thing about him is that he loves me no matter what and is so forgiving of me! I would take my hubby with me to the show. One of my most favorite things about him is how kind he is to other people, especially his patience with our kiddos. As much as I love my husband if I won these tickets I would take my seventeen year old niece. She is a wonderful girl who I do not get to do enough fun things with. She loves Bordinos and the WAC so it would be a perfect evening. Would love to win. My date/husband and I have been w/o a Dickson street date for so long! Used to be one of his favorites. I’d take my friend Jennifer because she never sits still and could use a night out! Plus, she cracks me up! I would take my husband. He came into my life when I was single with 3 kids. He adopted my kids and filled a void in me and them. I would take my husband. I love date nights with him because we rarely get them! My favorite date would be my granddaughter who is attending the UofA and working two jobs. It would be such a fun time to spend with her and give her a break from her studies. I would take one of my daughters. I want them to experience shows like this. Maybe I could buy tickets for the rest of the family. I haven’t been in her dear presence in a couple months! I would love to go! I’d take my husband as he enjoys shows at the WAC as well! I would absolutely LOVE to go and take my husband who is also my Best Friend! We moved here about a year ago and have not had the opportunity to see anything at WAC! It would definitely be a GNO!!! Nothing helps me relax and unwind from my crazy life as a single mother, workaholic and full time Nursing student like hanging out with my girlfriends! My date would be my wonderful husband. We enjoy going to shows on stage. It’s a great way to get out and enjoy time with each other. My husband will be out of town, so I would take my 11yo daughter. She loves singing, dancing and acting. She would be thrilled to dress up and go to the show! It would be a great date for husband and I. He is always working so hard to support us, he would really do well to have a night off. I would either take my husband or one of my daughters. And I love everything about all of them!! Commented on your wall and follow you on Twitter and Pintrest! My date would be my husband. This would be a first time for both of us to go to the WAC as a date night. We would love to do something new!! My would be date is my best friend…my husband. I would struggle deciding which of my kiddos to take. My son, who would love to try Bordinos, or my daughter, who loves dancing. When push comes to shove, my husband is always there to help me out–even if it means cleaning windows before company comes! Time for us to have a night out together. My date would be my 10 year old son. He has become interested in all aspects of stage and theater and I love the opportunity to take him to as many shows as possible. My date would be my 15 year old daughter. I’m so lucky that she still (sort of) likes to hang out with me. She loves all things related to drama and I think she would really enjoy seeing Pippin and having a night without her siblings. I’d take my darling son, he’s never been to a live show before and I’m sure he’d flip for it! My favorite thing about him is his zest and enthusiasm for life, He’s super affectionate and outgoing! This would be a perfect evening out with my daughter. 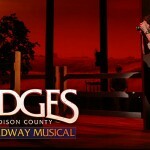 She is a talented and creative young lady who is a huge broadway/musical theater fan. She loves the food at Bordino’s, going to the Walton Arts Center and has wanted to see Pippin since the Tony Awards in 2013! My date of course would be my hot amazing husband. Although we promised this year we would go on a date at least once a month we have not followed through our committment. It’s been a very hectic year and would love to win this opportunity. Also following on Pintrest and subscribed to your newsletter! I’ve never been to a musical. This will be a great opportunity for me and my daughter to have this first experience together. I would take my boyfriend Brad. My favorite thing about him is the way he looks at me. He makes me feel so special, like I’m the only person in the world at the moment. I would love to have a fun date night with him! My favorite date for theater is my daughter…who really wants to see Pippin and all the others this season! MY FAVORITE THING ABOUT MY DATE IS HE’S MY LOVE. My husband is a GREAT man who has helped me so much during this last trimester of pregnancy. Would love him to have a good meal and get out together before baby’s arrival! Sounds like the perfect date night out with my husband! And our fav is Bordinos. Would love the chance to win this giveaway! Everything about my “date” husband is perfect! It would be the best gift to win this, we will be celebrating our 8th anniversary that week also! I would take my husband because we love the performing arts. We just moved to NWA and have yet to see a show. I’m looking forward to exploring the area. I’d take my bestie because she loves the theater and is a foodie like me! We’d have a blast! I hope it’s not too late! I’ve been waiting for Pippin to come with baited breath and would love to see it! Thanks so much for arranging for these freebies!